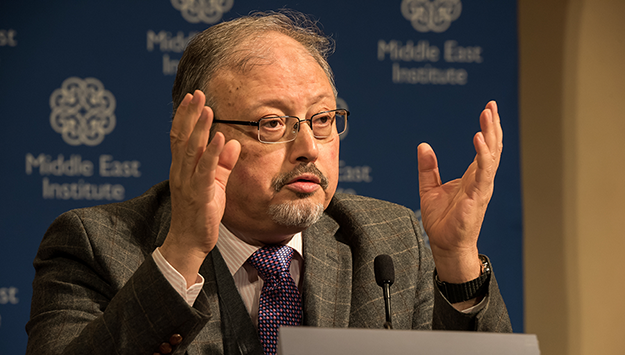 In this week's briefing, MEI experts discuss recent and upcoming events including the disappearance of journalist Jamal Khashoggi from the Saudi consulate in Turkey, the arrests of an opposition leader and a prominent journalist in Pakistan, and Iran’s decision to join the Financial Action Task Force (FATF). The disappearance of journalist, friend, and colleague Jamal Khashoggi from the Saudi consulate in Istanbul last Tuesday shocked and continues to gravely worry all who knew him. It also continues to fuel calls for a transparent and rapid accounting of what happened and where he is; all parties, including Riyadh and Ankara, have an interest in this. The crisis will likely dominate Middle East policy and opinion circles in Washington and internationally this week, and might impact U.S.-Saudi relations. The U.S. president, vice president, and secretary of state all issued statements of concern, and State Department sources indicate that they are trying to find out where he is—and, if he’s still alive, work toward a positive outcome. The Trump administration has maintained very close relations with Riyadh, distinguishing itself from the previous Obama administration. But even for Trump, the relationship is not without its complexities. In particular, rising oil prices have had negative consequences for his electoral base and on the surging U.S. economy. He has been pressuring the kingdom to use its influence to bring those prices down, and called out the kingdom in his U.N. speech as well as in recent election rallies. This crisis might factor into this negative dynamic. The coming days will be critical in finding out if Jamal is alive or not. If the latter, this tragedy is likely to have significant implications for the U.S.-Saudi relationship and for Riyadh’s relations with other, especially Western, capitals and capital. Fears that Pakistan’s recently elected, professedly reform-minded government is set to pursue a politically vindictive and illiberal course were strengthened by two events last week. In one, the leader of the parliamentary opposition, Shahbaz Sharif, was arrested and charged with graft from his time as chief minister of Punjab province. Shahbaz Sharif is expected in court this Saturday, notably just a day prior to scheduled parliamentary by-elections. In a second action, Cyril Almeida, a popular and respected journalist for Dawn, Pakistan’s leading English language newspaper, has been accused of treason and jailed for a published interview with deposed former Prime Minister Nawaz Sharif. In that interview, Nawaz Sharif appeared to back up India’s claims of Pakistan’s military having had a role in the momentous 2008 Mumbai terrorist attack that took 160 lives. Both moves are widely seen as evidence of the military’s heightened presence in Pakistani politics. For many, Prime Minister Imran Khan carries the stigma of having had the military’s poorly disguised backing in his party’s capture of power. The charging of Shahbaz Sharif, however justified, can be easily interpreted as designed to further cleanse Pakistani politics of the Sharif family. Almeida and his paper have had a previous run-in with the military after reporting a meeting in which Nawaz Sharif’s late government confronted the generals over interference in the country’s judicial process. The current case, following on the military’s believed media intimidation leading up to August’s parliamentary elections, threatens to have a chilling effect on media freedom, and to carry implications for other civil liberties under the Khan government. This past week, Iran’s 290-member elected parliament voted to join the Financial Action Task Force (FATF), a global body that takes action against money laundering and terrorism financing. Passing the legislation is critical for Tehran to remove itself from FATF’s blacklist, attract foreign investment, and rejoin the international banking system. And yet the fate of the legislation is uncertain. In the maze that is Iranian policymaking, the ultimate decision rests with the Guardian Council, a body of 12 unelected men whose only job is to please the unelected supreme leader, Ayatollah Ali Khamenei. The Guardian Council has one key role: to defend the interests of Khamenei and the other hard-liners in the Iranian regime against any loss of influence. These hard-liners fear that joining the FATF will hamper Iran’s ability to support Tehran’s regional allies such as Lebanon’s Hezbollah. For months they have argued that accession to FATF is tantamount to defanging Tehran’s revolutionary agenda. And yet, the FATF vote would have never reached the parliament had Khamenei been altogether against it. Why then the farce? It is a case of Khamenei backtracking but without wanting to lose face. The reality is that Khamenei faces an Iranian economy on the brink of collapse. Matters could worsen should the U.S. sanctions set to take effect on Nov. 4 prove more biting than forecast. And yet wavering like this is classic Khamenei and the FATF saga is just another example of how Iran’s policymaking process is taken hostage by the very few who always put their own narrow, factional agenda above the national interest. This reality is true for other countries too, but in Iran, it is mind-bogglingly damaging.